This week ties the record for the worst week ever in terms of economic data relative to expectations – at least in the 2 ½ years I have been collecting this data and putting it through my proprietary analytics. With the benefit of the data through today’s employment report, ISM manufacturing index and construction numbers, it is clear that the weakness is no longer confined to manufacturing and housing, but has also dragged down employment and well as consumer spending and confidence. The chart below shows the aggregated data picture across all categories, since the beginning of 2010 across all categories. 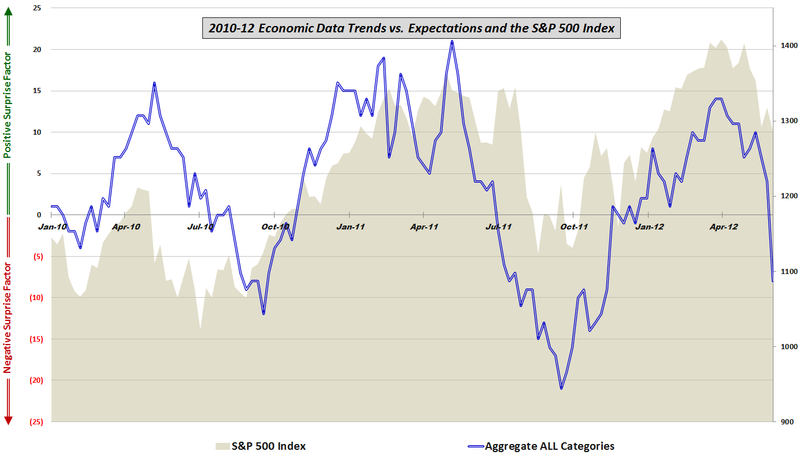 For the record, the only other time there was a week in which data was this poor relative to expectations was in the middle of February 2011, at which point the data was pulling back from an all-time high, about 2 ½ months before data and equities topped and began their swoon. This time around the story is obviously much different, but keep in mind that for the last six months or so stocks have been more correlated with employment data than with any other measure of economic activity.